As I've watched my sons develop into readers, I noticed how they both started to delve deeply into a preferred topic in second grade. My older son read about airplanes and the physics of flight, while my younger son has read everything about cats. Watching these two readers has helped me to think about how topic knowledge is inextricably linked to reading skills. Their background knowledge about a topic helped them to attack and read increasingly more difficult texts. It seems logical, then, that we should try to replicate this in our classrooms. But topic studies have gone in and out of style. When I started teaching (in the 90s! imagine! ), thematic units were popular. But they weren't really structured. The idea--at least as it was communicated to my inexperienced teacher brain--was to gather as many resources as you could on a topic or theme, and then have students create some big project related to the theme. As time passed and guided reading became popular, themes fell out of favor. Leveling was everything. I was told that trying to gather resources on a topic was useless. We'd never be able to afford to get every book at the levels we'd need, and it was far more important for kids to be reading texts at their levels than it was for them to study a topic. I got around this by starting to write my own texts, apologetically at first. But the more that I watched my own children become readers, the more I realized that seeing the same topics over and over was really important. Now, topic studies are in style again. Yay! What I like about topic and theme studies as discussed in the Common Core is that they are to be structured with increasingly complex text. This mirrors what I see with Zachary and Aidan...the facts they learn from the easy text become necessary background knowledge to help them comprehend more complex text. As I plan for this year's version of the Antarctica nonfiction unit, I've tried to be more conscious of how students are building their knowledge. I'm hoping to marry certain concepts about Antarctica with concepts about nonfiction. Here is the plan. 1. Choose your nonfiction skills to teach. This year, I'm starting with paraphrasing. Then I'll move on to topics and main ideas, text features, and finally synthesizing. In the past, I did text features first. But this year I decided to change it because I want students to see how text features help to convey topics and main ideas. I'm a weekly planner, so I choose texts for each week. At the beginning, I'm using some texts that I've written. This will help to build up the background knowledge that kids will need to get to the ideas in the more complex texts. But I'll also be using Trapped By the Ice, texts from Beyond Polar Bears and Penguins, and the LTER blog. As you choose texts, it's important to consider how ideas appear again and again. What are the most important concepts you want to wring from the topic? 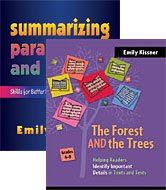 How are these concepts represented in texts? 3. Create a unit anticipation guide. 4. Gather guided reading and auxiliary texts. This process may take a few years. I pick up books wherever I can. It becomes a sort of "stone soup" situation--everyone working on the unit has a few things to contribute. Surprisingly, even texts that seem only tangentially related often offer kids some little gems of knowledge that they can weave into their schema. 5. Create a list of unit vocabulary. This year I've started to be much more intentional with my vocabulary teaching. What words do kids need? Which words show up again and again? I do a weekly homework packet in my classroom, and I've included five vocabulary words (along with a related text) in each packet. It all sounds like a great deal of work, and it is. But it is so worthwhile to hear kids sharing ideas and reflecting on what they've learned across texts. Whether topic studies are in style or not, they are a wonderful way to help students learn. Just as I like to work on summarizing throughout the year, I also like to work on comparing texts. Kids naturally enjoy finding connections between texts. If I model this early in the year, we can make strong connections all year long. I decided to start with two quick pop-up books. The first reason for my choice was a practical one--I wanted really short texts that we could read in five minutes or less. But the second reason was a little deeper. I wanted to show students how even very short texts can communicate a theme in words and pictures. 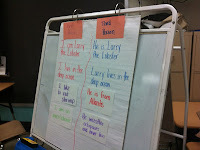 After we read the books, we completed a chart to compare them, looking at the themes, the illustrations, and the text. One student added a new detail: "Both books show a problem that has to be solved!" When we used the chart to write a paragraph, I modeled starting with the heart of the comparison--why these books are being compared. Beautiful Oops and Big Frog Can't Fit both express deep ideas through playful words and pictures. Pop-up books often don't have much of a place in intermediate classrooms...but these books are so engaging that they can really be useful tools. Point of view is now a fourth grade skill! Hooray! Cheering was not actually my first instinct. But I've taught point of view to fourth graders over the past three weeks, and I've learned that it is not actually as hard as I feared it might be. Here are some hints to get started. When I taught point of view in sixth and seventh grades, I could jump quickly into the abstract. We went right into looking at texts and writing them from different points of view. I live in the ocean. 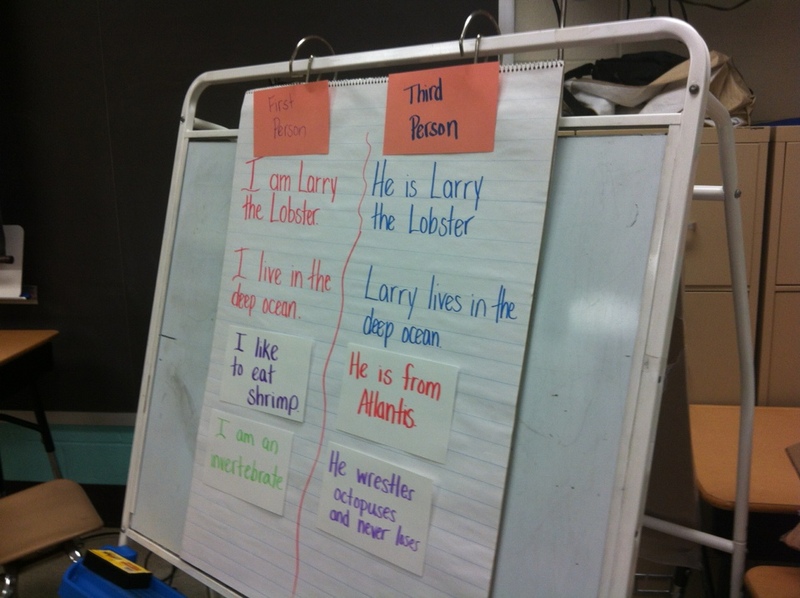 Larry lives in the ocean. I called on students to categorize the cards. Which ones were the most similar? Why? It was only after they could explain the difference between who was narrating the action that I introduced the terms first person and third person. Next, students chose stuffed animals for writing buddies. 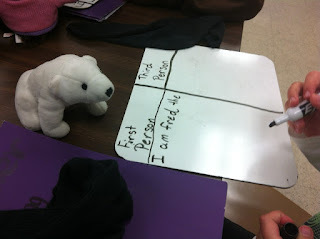 On white boards, they tried writing two sentences about their stuffed animals--one in first person, and one in third person. Once I looked over their sentences, they recopied them onto index cards. We regrouped and took turns classifying each student's sentence and guessing which stuffed animal was the star of the sentence. Once students had an initial understanding of point of view, we had a huge storm. We were out of school for two days and then spent two days in classes at the high school--how exciting! Our school did not have electricity, but the other schools in the district did. The teachers were wonderfully accommodating and the students were great. I split my reading class into three so that students could hear read alouds from each point of view. Luckily I had been planning to do a presentation before the hurricane interfered, so my suitcase was filled with books. I needed short, easy books that high schoolers could quickly read aloud. Shortcut by Donald Crews is one of my favorite go-to books for teaching so many different ideas. Personal narratives, intertextual connections, suspense, use of long and short sentences....and now point of view! Mr. Gumpy's Outing by John Burningham was a good choice of a third person book--short, easy, and clearly third person. It's tempting to leave out second person. "No one uses it much," I've heard teachers say. But if you're taking the time to deal with first person and third person, second person is not that tough. Besides, kids love second person. It's the language of the Choose Your Own Adventure and Interactive History books! During our rotations, I read the second person book, choosing excerpts from the Underground Railroad Interactive History. We talked about why authors might choose second person, but why some readers really resist reading texts that are written this way. While these short read alouds weren't what I originally planned, they worked out wonderfully to teach reading in an unfamiliar classroom in an unfamiliar school. Once we returned to our own school, with the excitement of our adventures behind us, we continued our study of point of view. A card match activity was fun--students received cards with pieces of a story in either first person or third person, and had to find the student with the corresponding card. "I can help paint!" Ben said excitedly. Students see that word I in the dialogue and say that the story is in first person. In these cases, I ask students: Who is telling the story? Is the narrator a character in the story? I try to lead them to think about what the story is really saying. Then, if they are still confused, I just say---"When we talk about point of view, don't pay attention to the dialogue. Look for what's happening outside the dialogue." And sometimes this works.